Both the legs and neck of the animal are extremely elongate. The body is short-coupled and the back is sloped upwards from the tail to the base of the neck. There are two ossicones, known by most as “horns” on the skull and a large bump in the middle of the forehead. The eyelashes are quite long and thick. Wild – Giraffes are browsers, taking leaves and shoots of Acacia and other trees and shrubs. The only competition that the giraffe has for food is the elephant. Zoo – Alfalfa, omolene, tree browse and grain. All Giraffes are mottled tan and cream to distinct orange or dark liver blotches on a white background. The various subspecies are told by the size and shape of the dark blotches. The edges of the blotches on the Reticulated Giraffe tend to be straight, like cut paper, while those of the Masai Giraffe look like torn paper. Rothchild’s are like the Masai but with a darker center on each spot. The eyes are a dark brown and the mane, ossicone tassels and long tail tassel are black. Sociable by nature, Giraffes live in loose groups but do not form permanent herds. Adult males, called bulls, have an identifiable pecking order that is established through a ritual of neck wrestling. Females, called cows, move in and out of various groups, and generally hang together more for the watchfulness of others against predators than for companionship. Giraffe very seldom graze, for the same reason that they take great precautions when drinking. Their necks, long as they are, are not long enough to reach the ground. Giraffes must spraddle their legs, or buckle them in a very ungainly manner in order to drink. They must be quite certain that there are no predators around before lowering themselves into such a vulnerable position. Their long necks offer an excellent field of view but they depend on the alarm of others when drinking. If they need to defend themselves, they can run 30 mph, with a stride speed of 25 or more feet. Giraffes have an extraordinary circulatory system. For instance, they have the highest known blood pressure but, interestingly enough, the blood pressure to the brain drops when the giraffe lowers its head. The blood vessels in the giraffe’s neck are extra heavy – thick walled – in order to withstand the great pressure without a blowout. A giraffe’s long neck has the same number of vertebrae, as most mammals, seven, but each is disproportionately long. Giraffes are ruminants, like cows, with a multi-chambered stomach. The giraffe has a 19-20 inch prehensile tongue that enables the animal to pick shoots and leaves from between the very long thorns of the acacia trees. They have tough mouths and copious amounts of viscous saliva to deal with large thorns. Females bear one calf that will stay with the mother until the next calf is born, and will often hang out with them for the next year. The calf is about 6 feet tall at birth. The legs of adult giraffes are about 6 feet long to the belly (elbows and knees) so the calf must be that tall to reach the udder for its milk. The calf’s neck is quite short, relatively, but it elongates rather quickly over the calf’s first few months. Giraffe cows deliver standing up. The calf’s front toes appear first, the long legs following, with the neck and nose laid along those legs. The calf may hang, suspended from the waist for what seems an interminably long time and then whoosh. The cow squats and the calf slips out and slams, splat on its side. The fall is actually only about 3 feet. The shock causes a sudden inhalation and breathing begins. The cow will lick the newborn and it soon raises its head on a wobbly neck. A normal calf stands within about 20 minutes and can run within hours. Giraffes were once thought to be mute, but they do make a soft lowing, especially when with the calf. 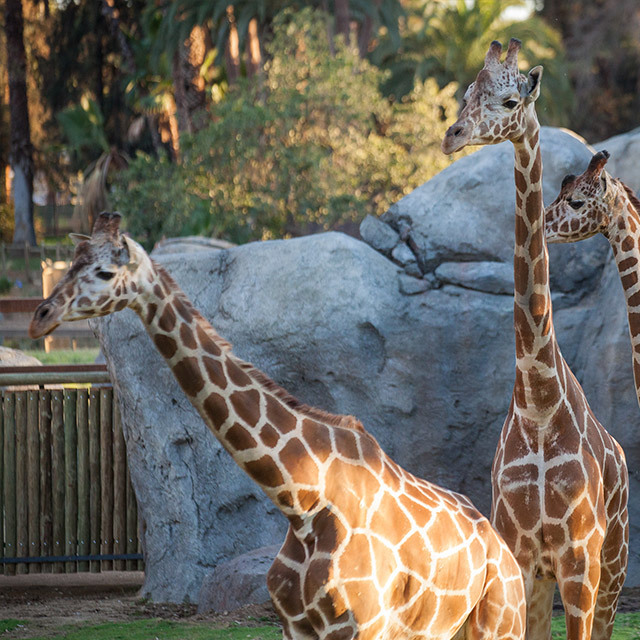 Lifespan Healthy giraffes live about 25 years in the wild. Height Males reach 15-20 feet and females 12-17 feet. Weight Males range between 1,765-4,255 pounds and females 1,215-2,600 pounds. Diet Giraffes browse (take leaves from trees and bushes), they cannot graze (taking grass from the ground). As a species, Giraffes are IUCN listed as Least Concern, but some subspecies are Endangered. To eat, a giraffe swallows its food and then brings it back up to chew as cud, a lump of semi-digested paste.